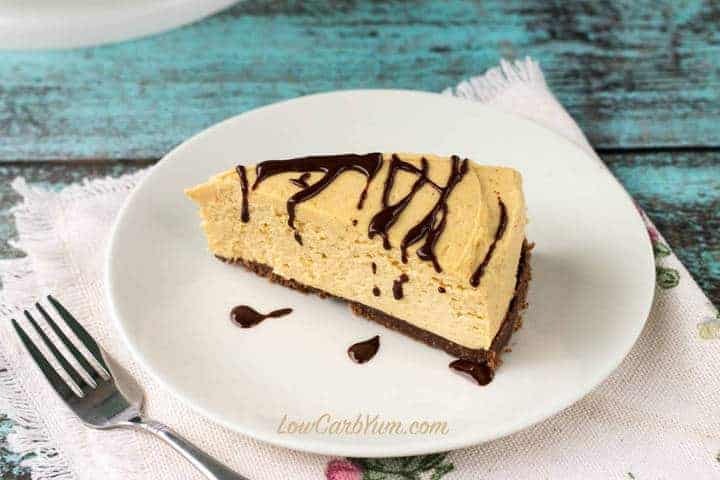 Enjoy this yummy low carb no bake peanut butter cheesecake any time of year. The gluten free crust is sweetened blend of almond flour, cocoa, and butter. 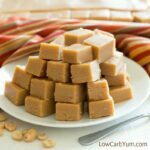 It’s hard to believe that there are only a few peanut butter recipes on this blog. Peanut butter is one of my most favorite flavors, especially when mixed with chocolate. 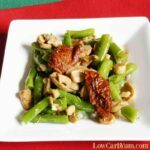 I’m going to have to come up with a few more peanut butter recipes to add to my collection of low carb goodies. 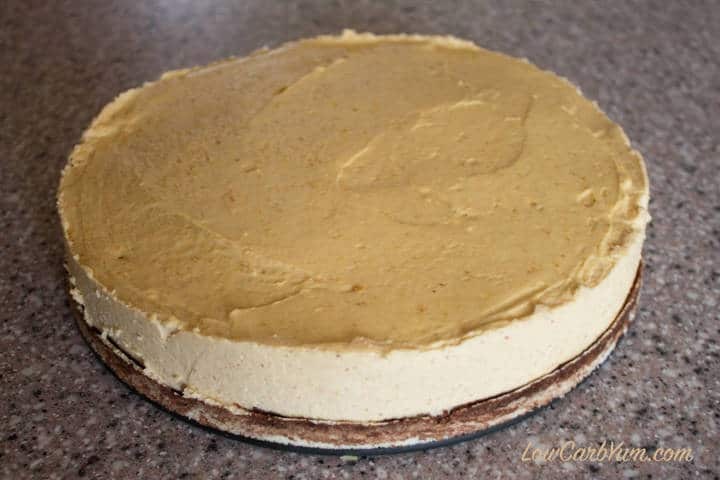 To start things off, I created this recipe for a low carb no bake peanut butter cheesecake. 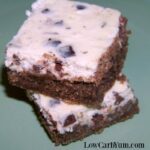 This yummy treat is a perfect dessert to share at summer gatherings because it’s no bake. 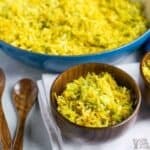 But, it’s also a recipe that can be made year round. 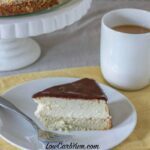 Even family and friends who don’t do low carb will gobble down this tasty sugar free cheesecake. With the heat of summer, no one wants to be turning on a hot oven to bake a traditional cheesecake. 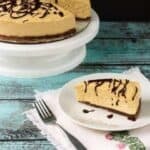 This no bake peanut butter cheesecake is made in a springform pan to give the look of a baked cheesecake. But, it sets in the refrigerator. 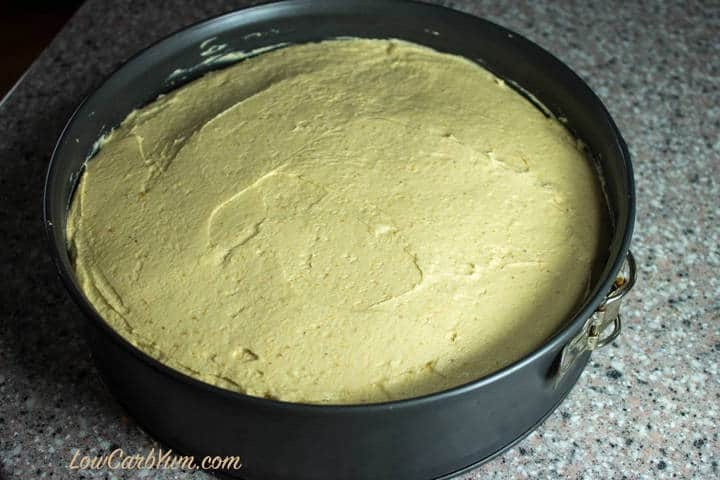 I considered making this in a pie pan like I usually do for no bake cheesecakes, but I thought it would give a much better presentation using a springform pan, and it certainly does. The gluten free crust is just a mix of almond flour, cocoa, sweetener, and butter. 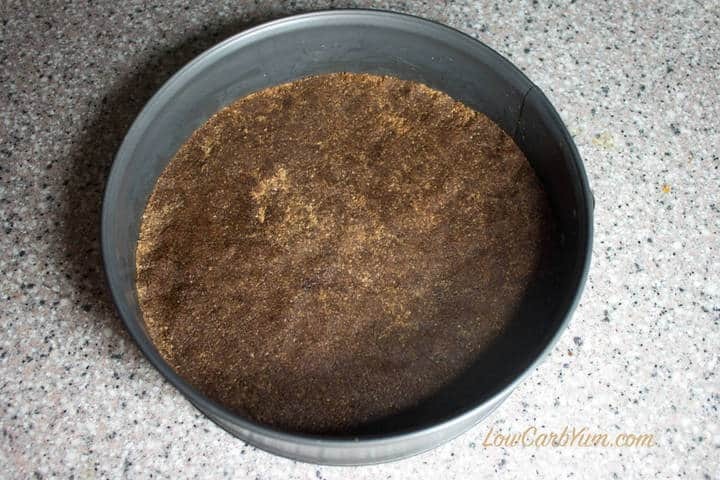 To make for easier cleanup, everything is mixed inside the pan and then just pressed in. When making the crust, I find it easiest to press the crust down with my hand. I do cover my fingers with a plastic baggie so the crust mix doesn’t stick to my hand. 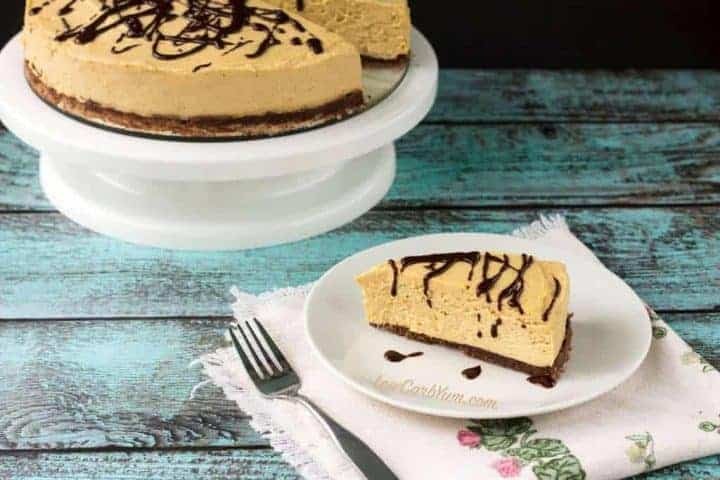 You’ll want to make sure that both the cream cheese and peanut butter are at room temperature so that they are easier to blend with an electric mixer. If you don’t have time to wait, it usually only takes about 30 seconds to warm up in the microwave. Sweetened stabilized whipped cream is perfect for making no bake desserts. It’s just heavy cream whipped with gelatin added to prevent it from deflating. But if you’d prefer not to use gelatin, 1/4 to 1/2 teaspoon of cream of tartar can be used instead. Fresh whipped cream also gives the dessert a light and airy texture. To keep the whipped cream from flattening out, it needs to be gently folded into the peanut butter cream cheese mixture. 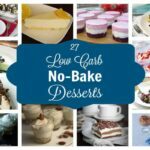 If you want to cut back on carbs, you can always omit the crust. Just spoon the filling into individual dessert cups. It’s more of a peanut butter cheesecake mouse if you do that. 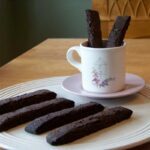 Without the crust, I’d serve it with drizzled chocolate or sprinkle each serving with chocolate chips. Chocolate really enhances the flavor and color of peanut butter desserts. I wasn’t planning on adding chocolate to the top of this cheesecake. But, when I removed the springform pan side, it was really plain looking. The cheesecake was begging for some color on top. I thought about just sprinkling on some chocolate chips to give a contrasting color, but I knew that might add too many carbs. So, I made a small amount of chocolate ganache to drizzle over the top which really made . The chocolate ganache will harden in the refrigerator. You can omit the chocolate drizzle or coat the entire top of the cheesecake with chocolate if you wish. 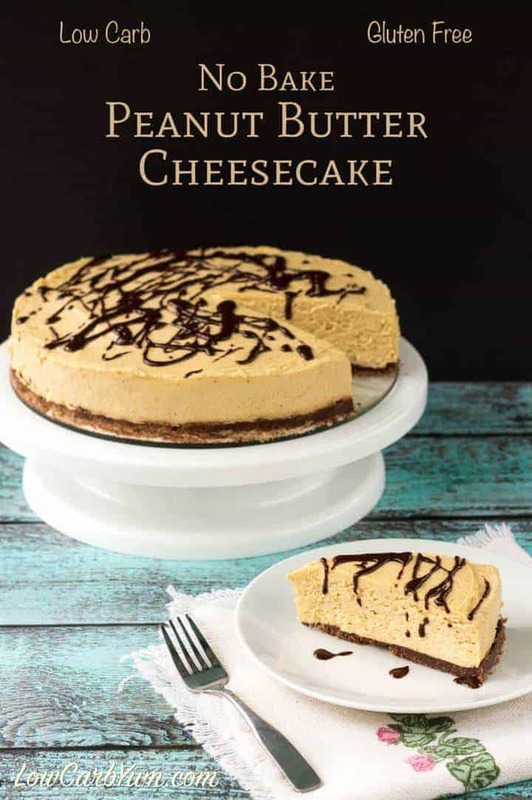 This rich and creamy cheesecake is sure to be enjoyed by all! 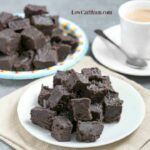 If you love this recipe, you need to try my low carb cream cheese peanut butter fudge. 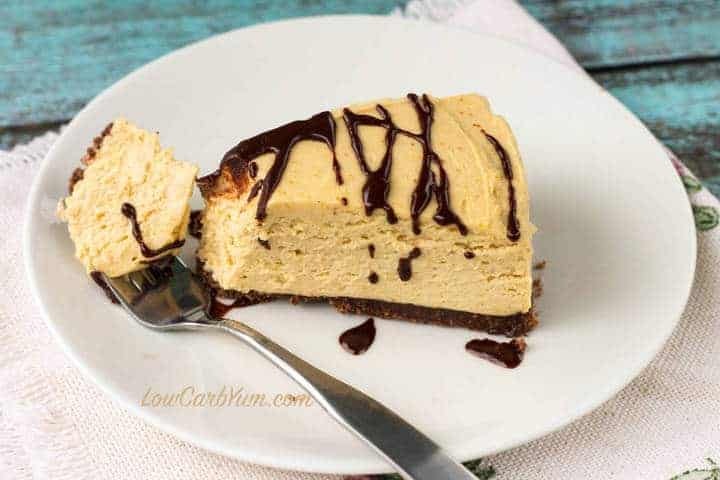 Enjoy this yummy low carb cheesecake any time of year. 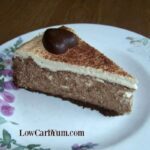 The gluten free crust is sweetened blend of almond flour, cocoa, and butter. Whip at high speed until stiff. Set aside. 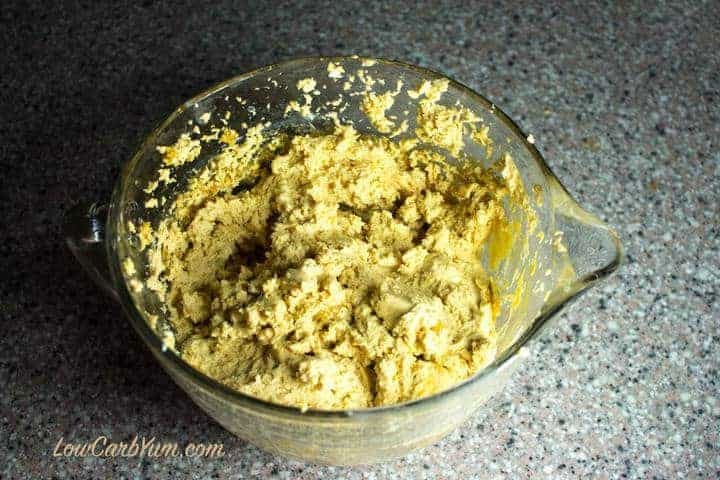 Mix cream cheese, sweetener, vanilla, and peanut butter in a large bowl with electric mixer until well combined. Gently fold in stabilized whipped cream. Pour filling over crust and smooth top with rubber spatula. 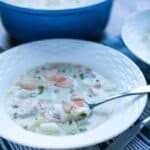 Refrigerate at least 4 hours or until firm. Run knife along edge of cheesecake in pan, then remove springform side. Melt butter and chocolate in a small saucepan or microwave. Stir in powdered sweetener and vanilla. Drizzle chocolate sauce over top of cheesecake. 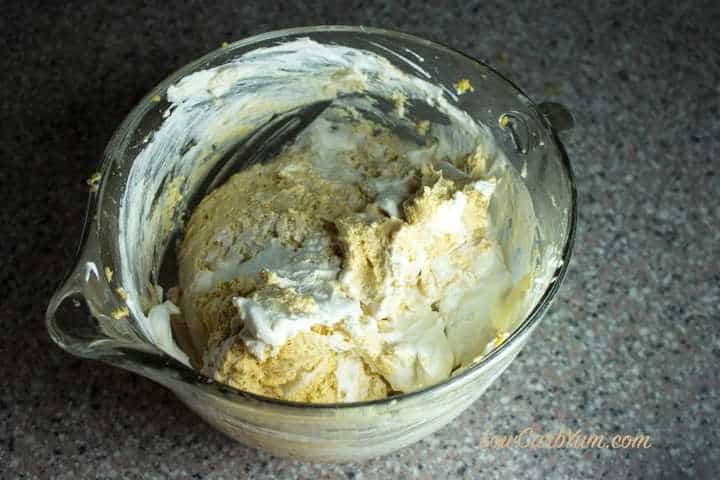 The whipped heavy cream can be stabilized with 1/4 to 1/2 teaspoon cream of tartar for those who prefer not to use gelatin.